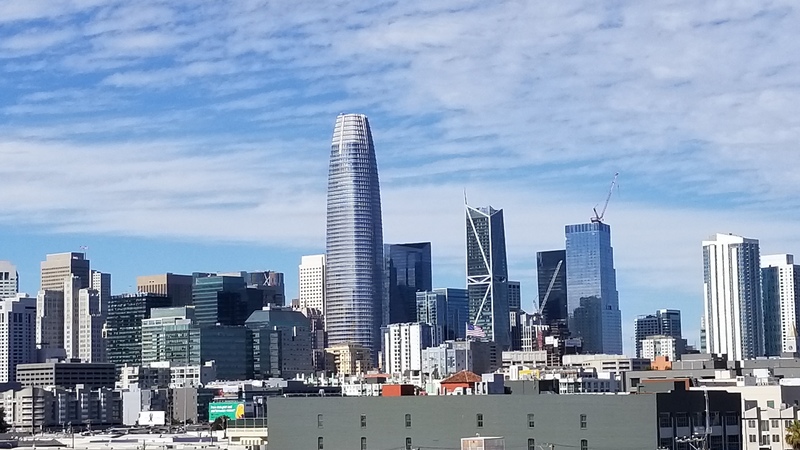 San Francisco’s skyline is constantly evolving and always dramatic. and contact the San Francisco Convention & Visitors Bureau for activity calendars and tips. With a nickname like “City on the Bay” and favorite tourist attractions like the Golden Gate Bridge, Alcatraz Island and Fishermen’s Wharf, many families think only of staying as close to the busy waterfront as possible. It’s a good choice if you’re only here for a night or two because of its convenience, and the surrounding streets are very flat — a big perk if traveling with elders or tinies in strollers. However, the hustle-bustle of tourists is relentless. Hotels are mostly in the $200-$400/N per double price range, though frequent specials and weekend discounts are available. Don’t miss a breakfast or lunch at Boudin Bakery, the original sourdough plant on Fisherman’s Wharf. We have to admit they had us at the name Argonaut, the famous band of adventurers who followed the Greek hero Jason in his quest for the Golden Fleece. Greek history aside, what makes this place special is its location in the ca. 1907 Haslett Warehouse at the far end of Fisherman’s Wharf. Exposed brick, Douglas Fir beams and a boutique-y stylish lobby with fireplace and nautical themed seating add to the charm. Rooms are blue, white and comfortable, pets are welcome, the staff is friendly and their cafe whips up a great clam chowder. Rooms are small and cozy, and rates include complimentary bikes if there are any left. Note the presence of an irksome $25/day Urban Facility Fee which includes (free) Wifi and a $10 food/beverage credit. Located southeast of the Wharf at Beach Street, just a block from the waterfront, this hotel offers a heated outdoor pool (seating area has firepits too), underground parking, fully stocked fitness center and a stylish high-top table Link@Sheraton breakfast and snack lounge that get better ratings than the 531 rooms. Children under 17 stay free with parents and connecting rooms are available. Located just south of the Wharf, this recently renovated place has bright nautical theming, big rooms, complimentary WiFi, mini-fridge, and big HDTVs that may even distract you from the views. The popular restaurant has a kid’s menu, there’s an expanded fitness center, and outdoor heated pool. Families staying longer may prefer the busy shopping mecca at Union Square which is close to the financial and theatre districts, near the newest art museums, and just a block or two from the cablecar lines. The city’s heart for more than 150 years, Union Square’s granite plaza, and sleek glass and chrome food concessions make it popular with visitors and, sadly, the city’s homeless. We were initially put off by this full-service Hilton’s size: 1,919 guest rooms, 151 suites and a 30,000-square-foot Grand Ballroom, until we spent two complimentary nights there appreciating the views, accommodating staff and location. It’s just off Union Square, near shops, museums and the Powell Street cablecar line (make sure to take the kids to the garage to see the parked “cablecar.”) The Hilton San Francisco Union Square boasts stunning city views from the higher floor rooms, which are comfortably large, packed with amenities and nicely furnished. There’s an outdoor heated swimming pool that’s well worth the plunge, and lobby food outlets ranging from the fashionable Urban Tavern to a grab’n’go that accommodates any whim. Best of all is the 46th floor Cityscape Lounge – a fun, skyhigh bar scene whose 360-degree views of the city, mixologist and tasty bar food wowed our millennial. It’s a must see for visitors whether guests of the hotel or not. Cablecars bells clang past this huge historic hotel, complete with marble lobby and luxurious accommodations and services. There are 1,195 accommodations; rooms in the original building are smaller than those in the modern tower, and there are many sizeand layout variations. Ask about Westin amenities such as loaner jogging strollers, potty seats, bicycle seats and babysitting. Children under 18 stay free and all hotel restaurants offer children’s menus. A big plus is the new Rejuve Wellness Center and Spa, which is doing both wellness and cosmetic work, with massages, yoga classes, nutrition workshops and a Beauty Lab to help guests customize makeup applications. Non-smoking and pet-friendly, this historic 161-room hotel offers a charmingly cultural visual experience with its eclectic, world-cultures decor. Environmentally responsible, carbon-neutral and LEED certified, the Carlton also focuses on reducing waste, pollution and supporting locally sourced food. There’s a friendly vibe at all Joie de Vivre Hotels, with complimentary wine receptions, knowledgeable staff and a commitment to supporting the surrounding community. 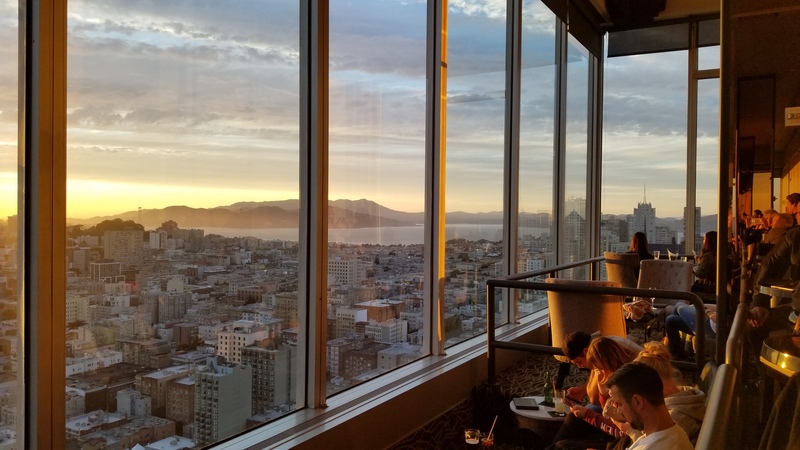 Guests at the Cityscape Lounge on the 46th floor of the Hilton San Francisco Union Square are busy Instagramming the 360- degree views. Nob Hill is posh and tranquil, with stuning hilltop views and a quiet, fun playground for little ones. Prices and charm drop as you descend the hill towards downtown and Union Square. Read FTF’s full review of this classic hotel; it’s a stunner: San Francisco Fairmont Does Family Well. Atop Nob Hill on the site of railroad scion Leland Stanford’s mansion, this grand hotel features a Tiffany glass dome and a mural depicting San Francisco’s history. There are 384 elegant rooms, many with fabulous views of San Francisco Bay plus many tiny ones that only face inward but start at just $104 per night. All the rooms welcome families and pets; only the outward facing ones connect to accommodate more than four people. There’s a 24-hour fitness room, bike sharing station (hills alert! ), high tech business center, a good cafe with farm to table cuisine, good quality WiFi and gracious service. This is one of the small “boutique” hotels that San Francisco’s known for, with a helpful staff in the downtown area near Union Square. The jewel of a Bijou, with its wonderful Deco lobby, pleasing color scheme and hip but friendly style, is one block from the Powell & Mason cablecar line in a “real” neighborhood. They give a nod to the city’s cinema history by providing a complimentary double feature each night on your flat screen TV, and free breakfast and WiFI are included in rates that can start as low as $100. Refreshed rooms include two single or double beds, full bath tub, and enough space to add a crib or a rollaway. In the heart of the fascinating little neighborhood known as Japantown, families will find an unusual pagoda style hotel with a tiny Zen garden and 225 bright modern rooms (including 14 suites), some with Japanese touches. The Kabuki has undergone a $30 million refresh since our stay, adding a Kabuki Bar focused on sake and Japanese beer and spirits, plus an outdoor lounge and new fitness center. We love that it’s still surrounded by small sushi and tea shops in this West Side oasis near the old Fillmore concert hall and Haight-Ashbury. Kabuki guests have access to a library, loaner bikes, and you’re within a few blocks of Japantown’s quiet central square, the Kabuki Springs and Spa bathhouse, and free walking tours of Japantown sights. 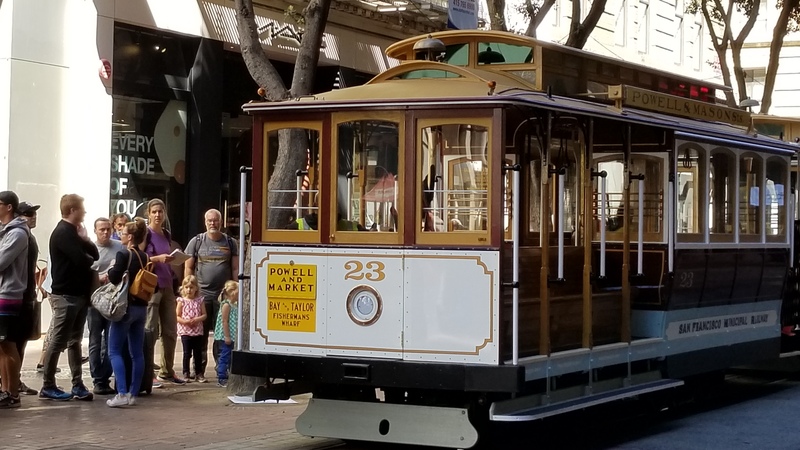 The Powell and Market Street cablecar is one of San Francisco’s best known attractions. As you explore the city away from the tourist haunts, you’ll notice dozens of quiet, low-rise neighborhoods with little motels that certainly look cheaper than where you’re staying. At our last visit, we checked into the Seaside Inn, one of the best reviewed of these mom n’pop places, and found a very clean, friendly place with tiny modernized rooms. The Front Desk man let us store our bags before our room was ready for checkin, and could not have been more welcoming. Rooms have a flatscreen TV; comfortable bedding; coffeemaker, fridge and microwave; and free WiFi. There’s a free, fastfood style continental breakfast you can take back to your room. Although it’s not designed for families, we saw many toddlers and it felt safe enough for teens who enjoy their independence. Truly a good value, Seaside Inn is right in the fun Marina District surrounded by coffee shops and ramen bars, about 10 minutes from the beach in nice weather; otherwise, inconvenient to the major sites. But of course you can use the hotel savings for an Uber or Lyft. thanks for sharing the wonderful and informative details. Love this blog post. Next month coming to san francisco and looking for best hotel.